On this page you will find an overview of the sizes and dimensions of our jewellery and wellness products. If you have any questions, you can contact us through our hotline ( ☎ +44 2088 199 781 ) or by using our Contact-form. Please note that not all bracelet sizes may be available. 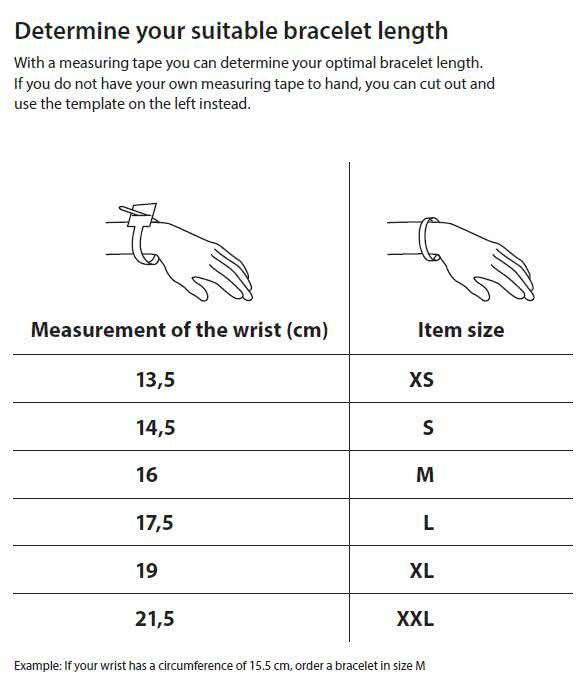 The available sizes will be shown when you call up the particular bracelet..
S-XL and L-XXL are variable sizes – you could adjust the sizes from S-XL und L-XXL easily. To do so, you simply select the required length. Bracelets with double sizes could be set to 2 sizes. You could set M-L either to size M or to size L.
Please note that not all necklace sizes may be available. The available sizes will be shown when you call up the particular bracelet. M-L and XL-XXL are variable sizes – you could adjust the sizes from M-L und XL-XXL easily. To do so, you simply select the required length. Necklaces with double sizes could be set to 2 sizes. You could set M-L either to size M or to size L.
Please note that not all ring sizes may be available. The available sizes will be shown when you call up the details on the particular ring. Some anklets are also available in variable sizes.